Oklahoma rightfielder Cody Reine (Walker, La.) is the Primtime Player of the Week and TCU righthander Kyle Winkler (Sugar Land, Texas) the Primetime Pitcher of the Week, with 11 others joining them on the Primtime Honor Roll (as selected by CollegeBaseball360.com). Reine and Winkler headline the 17th installment of the CB360 Primetime Performer Weekly Honor Roll, which includes 11 other players who helped carry their teams to the College World Series (or, in a few cases, to the brink of advancing). CLICK HERE for the Primetime Honor Roll archive (scroll down on that page for the 16 previous Honor Roll releases). REINE – who also was a CB360 Primetime Honor Roll selection following the NCAA Regional round – showed that he packs plenty of power into his 5-9, 215-pound frame, as the lefthanded-hitting cleanup hitter posted a pair of 2-HR games while sparking Oklahoma to the Super-Regional series win at #5 national seed Virginia (2-3, 10-7, 11-0). During the two wins, Reine racked up 11 RBI and hit 5-for-8 (plus a walk) while batting in the #5 spot. Oklahoma sophomore rightfielder Cody Reine homered twice in the series-tying win of the Super Regional at #5 national seed Virginia ... and he matched the 2-HR feat one day later, in the decisive third game (photo courtesy of Oklahoma). In the Super-Regional opener, Virginia ace Danny Hultzen limited Reine (batting cleanup) and six other Oklahoma starters to 0-1 hits, but Reine’s power stroke quickly put the Sooners back in the series. He drove in half of his team’s runs (5 of 10) in the game-2 win, starting with a 3-run blast in the 1st inning (0-1 pitch from Robert Morrey) as OU claimed an early 4-2 cushion. Five innings later, with the Sooners holding a 6-4 lead, Reine jumped on a 1-1 pitch from Cody Winiarski and drove the ball over the fence in right-center for another 2-run shot. The deciding game saw Reine rise up for 6 RBI, including a 1st-inning home run for the second straight day (this 3-run blast came with 2-outs, on a 1-0 pitch from Branden Kline). He added another 3-run HR in the 8th, as OU inched closer to Omaha. Reine is batting .341 for the season, with 42 RBI and 10 home runs. WINKLER was placed into a pressure-packed spot for game-3 of the Super-Regional series at #2 national seed Texas. Not only did he have the chance to pitch TCU to the program’s first CWS trip, but such a victory would come against the in-state rival that had knocked off the Horned Frogs one year earlier in the same Super-Regional round. TCU sophomore Kyle Winkler delivered a clutch game-3 outing at #2 national seed Texas, logging 7.2 shuout innings as the Frogs won (4-1) to secure the program's first College World Series trip (photo courtesy of TCU). With so much riding on his shoulders – and Texas talented #3 starter Brandon Workman opposing him – Winkler met the challenge head-on by working into the 8th while Workman (5IP-R-4H-4K) was forced out three innings earlier. The TCU sophomore was the much-deserved pitcher of record in the historic 4-1 victory, after limiting Texas to 5 hits and 3 walks in his 7.2-inning shutout stint (he struck out six 0f his 32 batters faced, during the 112-pitch outing). Winkler will enter the College World Series with a 2.84 season ERA and 12-1 record in 17 starts this season, plus 90 strikeouts, 33 walks and 103 hits allowed (.242 opp. batting avg.) in 114 innings pitched. • Must have been playing for or against a CB360 top-50 team (in the Composite National Rankings) or performed a high level in games that could be key to a team’s conference/NCAA postseason qualification/advancement; made significant contribution to team’s postseason positioning (single-game wins, “quality” wins, series wins, road wins, etc.). The other 11 members of the CB360 Primetime Performer Weekly Honor Roll for the NCAA Regionals include (see capsules for each player at bottom of release): Vanderbilt jr. DH Curt Casali (New Canaan, Conn.) … Florida State so. 3B Sherman Johnson (Tampa, Fla.) … Arizona State so. LHP Mitchell Lambson (Tualatin, Ore.) … Florida so. 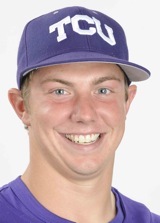 LHP Alex Panteliodis ( Tampa, Fla.) … TCU fr. LHP Matt Purke (Spring, Texas) … UCLA so. 2B Tyler Rahmatulla (Mission Viejo, Calif.) …UCLA jr. LHP Rob Rasmussen (Arcadia, Calif.) … Clemson fr. 1B Richie Shaffer (Charlotte, N.C.) … Oklahoma jr. RHP Bobby Shore (Oceanside, Calif.) … Alabama sr. 3B/RHP Jake Smith (Shannon, Ala.) … and South Carolina fr. 1B Christian Walker (Limerick, Pa.). The week-17 honorees include four impressive lefthanded pitchers (Lambson, Panteliois, Purke and Rasmussen), along with righthanders Winkler and Shore, the two-way talent Smith (3B/RHP), a pair of first basemen (Shaffer and Walker), second baseman Rahmatulla, third baseman Johnson, rightfielder Reine and DH Casali. The 13 selections feature the lone senior Smith, three juniors (Casali, Rasmussen and Shore), six sophomores (Reine, Winkler, Johnson, Lambson, Panteliodis and Rahmatulla), and the freshman trio of Purke, Shaffer and Walker. The honorees hail from nine different home states, including a pair of players (Johnson and Panteliodis) who were teammates at Alonso High School in Tampa, Fla. There also are three California products – Shore and UCLA teammates Rahmatulla and Rasmussen – along with two who have Texas hometowns (Winkler and Purke), plus one each from: Alabama (Smith), Connecticut (Casali), Louisiana (Reine), North Carolina (Shaffer), Oregon (Lambson) and Pennsylvania (Walker). 5-hole hitter who batted .500 (7-for-14) during tight Super-Regional series at Florida State, with FSU posting pair of 1-run wins (9-8, 7-6) while Commodores took game-2 (6-2) … had pair of RBI doubles (one in the 1st and another in 8th, for 4-2 lead) during win over the Seminoles (also scored a run) … his strong game in opener (4-for-5, 8th HR of season, 2-out RBI double) nearly carried Commodores to game-1 win … also had a pair of RBI in close series finale. Repeat CB360 Primetime honoreee who followed up clutch performances in the Regional round by delivering several key plays in hard-fought Super-Regional series vs. Vanderbilt (9-8, 2-6, 7-6) … factored into 3 runs (2RBI-2R; 9th HR of season) during the tight opener, also adding a single in 7th-inning rally that tied score (7-7) … singled and reached on a HBP in game-2 before driving in four of FSU’s 7 runs in the decisive third game (his 2-out/3-run double in the 8th turned a 4-3 lead into a 7-3 cushion … played error-free at the hot corner during the three games. Faced the minimum 15 batters in huge 5-inning relief appearance that closed 12-inning win (7-6) over Arkansas in Super-Regional opener … allowed pair of baserunners (H-BB) that were erased on a pickoff move and a batters-interference call … his 7 strikeouts included 3-up/3-down in the 11th. Continued his stellar season with yet another appearance on the Primetime Honor Roll, after logging complete-game victory in Super-Regional opener vs. in-state rival Miami (7-2) … faced only 30 batters (3 over min. ; 3H-BB) while recording 22 of his outs via strikeouts (12) or groundball outs (10, including a double-play) … retired finaal 14 batters he faced (6 Ks, 7 GOs) … located nearly 75% of his pitches for strikes (85 of 116). Extended his stellar rookie campaign by winning Super-Regional series opener at #2 national seed Texas (3-1), getting the best of pitchers duel opposite Cole Green (who dropped to 11-2, after 5.2IP-3R-5H-3BB-4H) … allowed the lone run while working into the 8th (7.2), with 19 of his outs coming via Ks (11) or groundouts (8) … faced only 28 batters (3H-BB-HB) in the 110-pitch outing, en route to a 14-0 season record. 3-hole batter who delivered one of the biggest hits in the entire 2010 NCAA Tournament, driving 3-1 pitch over left-center fence for 2-out/2-run blast in 9th inning of game-2 vs. Cal State Fullerton … that home run lifted UCLA into 7-6 lead and Bruins went on to force game-3 by winning in the 10th (11-7) … played error-free in the series (14 fielding chances) … also had pair of doubles in 4-3 opening-game loss (RBI, R) and closed 2-for-4 with an RBI in the 8-1 clincher. Lived up to his reputation as nation’s top #3 starter in the rotation, with 2-hitter that beat Fullerton in Super-Regional finale (8-1) … faced only 32 batters in that 112-pitch outing, limiting the potent Titans lineup to a pair of hits and a single walk (2 HB) while striking out 9 CSF batters. 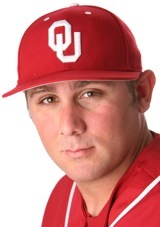 Cleanup/5-hole batter who filled that role in timely fashion by batting 5-for-8 in pair of wins over #5 national seed Virginia (with 2 HRs in each game), as Sooners overcame game-1 loss to win Super-Regional series on the road (2-3, 10-7, 11-0) … hit 2–for-3 with a walk and 5 RBI in game-2 before driving in 6 runs (3-for-5) during the stunning runaway clincher. 7-hole batter who had totaled only 2 home runs this season before besting that total with 3 HRs in Super-Regional series vs. Alabama (4-5, 19-5, 8-6) … hit 4-for-10 with 7 RBI in pair of wins over the Crimson Tide … smacked pair of home in decisive third game (3 RBI), after also homering in game-2 blowout (4 RBI, sac-fly) … drew a walk in low-scoring opener. Rose to the occasion in decisive third game of Super Regional at #5 national seed Virginia (11-0 win) … faced only 29 batters in his 8.0 shutout innings, allowing 4 hits and a pair of walks with 5 strikeouts in the 99-pitch outing … his clutch appearance helped Sooners complete series comeback, after narrow 3-2 loss in opener (won game-2, 10-7). Two-way talent who played big role in 5-4 win during Super-Regional opener at Clemson … went 2-for-4 from the 5-hole and smacked his 14th home run of the season, before closing the final 2.0 innings for his 6th save of the season (H, 2 Ks) … also homered in game-2 and had a walk and run scored in tight finale (8-6 loss). 5-hole hitter who helped South Carolina win Super-Regional series at #4 national seed Coastal Carolina (4-3, 10-9) … batted 2-for-5 in each of the wins, adding 5 RBI, 2 runs scored, a home run and hit-by-pitch … his 2-run single sparked SC to 3-0 lead in 1st inning of game-1 … supplied the big hit in the clinching win, as his 3-run blast in the 8th provided the final 10-9 margin (Coastal held an early 5-2 lead). Delivered game-3 Super-Regional win at Texas (4-1) that sent Horned Frogs to Omaha for the program’s first College World Series appearance … worked into the 8th to outduel Brandon Workman (5IP-R-4H-4K), logging 7.2 shutout innings with 5 hits and 3 walks allowed … struck out 6 of his 32 batters faced, during 112-pitch outing. * Reine is the CB360 Primetime Player of the Week and Winkler the Primetime Pitcher, for the NCAA Super-Regional round.